A 'Wrong Way Around' race wrapped up sailing today at the four-day St Barths Bucket Regatta, and it was more colorful and full of goodies than a child's Easter basket. 36 superyachts in four classes (Grandes Dames, Mademoiselles, Gazelles and J Boats) circumnavigated St Barths, giving Bucket fans on shore and at sea an awe-inspiring view of some of the largest and most beautiful and technologically advanced yachts sailing in the world today. The race course, which covered 21 to 26.4 miles (depending on the class), reversed Friday's 'Around the Island' journey and put boat handling skills to the test right off the bat with a downwind start. All but the J Boat class adhered to a pursuit race format, requiring each yacht to time its run to the gun for a separate pre-determined start time and hoist a spinnaker as soon as possible after crossing the starting line - the theory being that if all crews in each class sailed equally well, aboard their varied yachts of different speeds, they would meet at the finish line all together. The theory worked especially well today in the 18-20 knot breeze, with yachts barreling down on the finish line, drawn again by their giant spinnakers, within minutes - sometimes seconds - of each other. In the Mademoiselles class, the 55m schooner Adela, helmed by Dennis Conner, maintained her regatta-long position at the top of the scoreboard with a second-place finish today. Adela was presented with the St Barth's Bucket trophy as the regatta's overall winner. The 45 m Dubois designed Salperton IV, helmed by Shirley Robertson and with Cameron Appleton in the afterguard, won today's race to claim second overall, while another Dubois design, the 50m Zefira third. In the Grandes Dames class, the 48m Alloy Yachts-built Georgia claimed overall victory by crossing the finish line first in her class today. Georgia's Captain Brent Daw said that his yacht, conceived as the ultimate family world cruiser, has seen many ocean miles since she splashed in 2000, thus she is going into the yard for a refit after the Bucket. "We sailed steady and cautious like the hare and the turtle, and we were the steady turtle," said Daw, who came aboard as skipper of the yacht only three months ago. He added that the crew had to sail intuitively, since the majority of them are new to the boat. "The team is more of an organic group, a mix, nationally, of South Africans and Kiwis," he said explaining that former America's Cup helmsman Chris Dickson is helming. "The owner lives on board and loves a great day on the water. He is thrilled!" Claiming second place overall in this class, with a fourth today, was the 54m Perini Navi Parsifal III, while the 38m Axia, which was presented with both the All Star Crew Award and the Wolter Huisman Memorial Spirit of the Bucket Trophy at this regatta, finished third overall after posting a third for today. 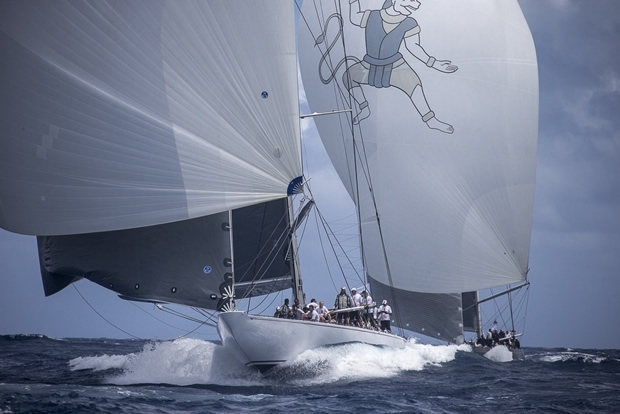 The winner of the Vitters Shipyard Seamanship Trophy was also from this class was the Perini Navi Zenji. One of the biggest stories on the water today was in the Gazelles class, where the 45m Visione, the 38m Perini Navi P2, and the 30m Cape Arrow were all tied with six points going into today's race. Trailing only one point behind was the Royal Huisman-built Unfurled, which won today's race to upset the apple cart and claim overall victory in the class. P2, which took home the Perini Navi Cup, took second today to claim equal points (8) with Unfurled but conceded on tie-break. Visione and Cape Arrow finished third and fourth overall, respectively. This was a historic event for the J Class, as it was the first time five of them have graced the same starting line since 1937. Hanuman, built by Royal Huisman, proved unbeatable throughout the three days, winning handily over the line and on corrected time in the first two of three races held here. Today, Lionheart edged out Hanuman by just two seconds at the line, but Hanuman still prevailed on corrected time to leave Lionheart in second overall. Velsheda, Ranger and the Holland Jachtbouw-built Rainbow followed in third through fifth places, respectively. Winning the King's 100 Guinea Cup for Thursday's 'extra day' race for the Js at the Bucket was Hanuman. The top Corinthian J with an amateur owner/helmsman to win the Corinthian King's Cup was Lionheart. "The owner was thrilled," said Bouwe Bekking, who called tactics on Lionheart. "This was his fourth regatta ever, and he has done remarkably well. For today's race, it was neck-and-neck with Hanuman after 26 miles. We knew that with them that close to us they would win, but we had to get our nose out there to win line honors. We loved that we got the gun." Bekking said that having the J Boats sailing fleet-style in their own group in the same regatta as the superyachts, which were sailing pursuit-style, worked perfectly. "It was great that we had our own start procession, it wouldn't have worked any other way. To manoeuvre these boats is way harder, so the emphasis on safety is good. It was really incredible, and we owe a great thanks to the Bucket Committee and the J Class organisation." Every year the Bucket Organisation devotes a portion of its entry fees for a worthy cause in St Barths. This year, a donation in the amount of 18,000 euros was made to the St. Barths Yacht Club Youth Sailing Program. Next year's event is scheduled for 27-30 March 2014.